Gold as a profitable investment asset is by no means at or even near the end of its road. The reason: the world's global economic malaise has only just begun. With very few exceptions, financial assets of all stripes and colors are dead-set on a downhill slope. In creeping growth or recessionary environments, stocks cannot thrive. At the same time, traditional "safe haven" assets like US treasuries are at historic price highs that are simply unsustainable. The only thing that currently holds them up is the US Fed's "operation twist". In other words, pure and overt manipulation. Deliberate price manipulations have one and only one possible ending: eventually, they always fail. Therefore, when the Fed's twisted policy finally fails (sooner, rather than later), US government bond prices have only one way to go, and that is down. It is therefore clear that any retirement portfolio that relies on the traditional mix of 40 to 60 percent bonds versus stocks is dommed to fail and will cause its owner massive financial and emotional pain. Rather, the price of gold sits solidly in the lower half of its even, well-defined, and continuously rising uptrend channel. The recent intermediate top that breifly took gold outside of this channel was ltierally self-correcting. 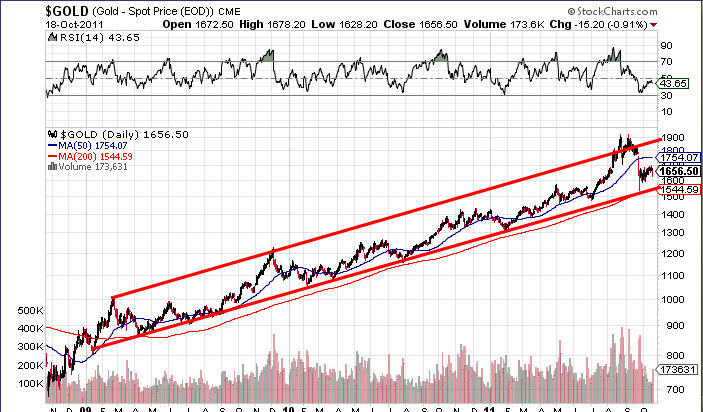 From a techncial perspective, therefore, gold's continued potential to rise it unquestionable. From a fundamental standpoint, gold looks even better. US interst rates are at historic lows across the entire maturity spectrum. The US and other world governments (with the exception of China) are standing ready to inflate thir currencies even more.